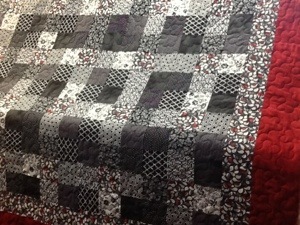 Finished a great black, white and red quilt for Esther. Putting the binding on and making an embroidered label for her. It’s a great quilt! 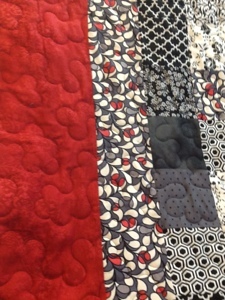 Working on a show quilt that’s really looking good. surprise later. It reminded me of an old argument I have had with myself and others. Black and white…all colors?, no color? Sew….decided to study up on that for my color exercise today.
. Guess what? Still no definitive answer. Seems like it depends on whether you ask an artist or a scientist. In art, black is all colors and white is the absence of color. In physics it depends upon the reflection of light. White is the reflection of all colors and black reflects no colors! Now, not sure I have a great answer yet but I am starting to get it!